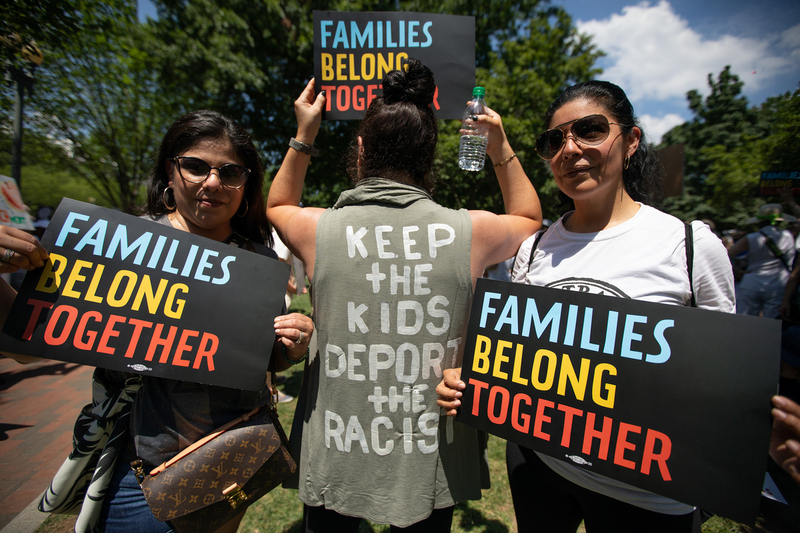 For Women At D.C.'s 'Families Belong Together,' The Protest Was Personal Motherhood was a core theme of Saturday's protest, which drew families and their young children, as well as anti-abortion-rights activists. Kara Howard, 26, an English-language teacher at Cesar Chavez Public Charter School, was compelled to join the protest because of her students' deportation experiences. The protest crowds started convening in Lafayette Square on Saturday morning for Washington, D.C.'s "Families Belong Together" rally. The forecast for scorching temperatures didn't turn away participants of the protest; they came prepared. 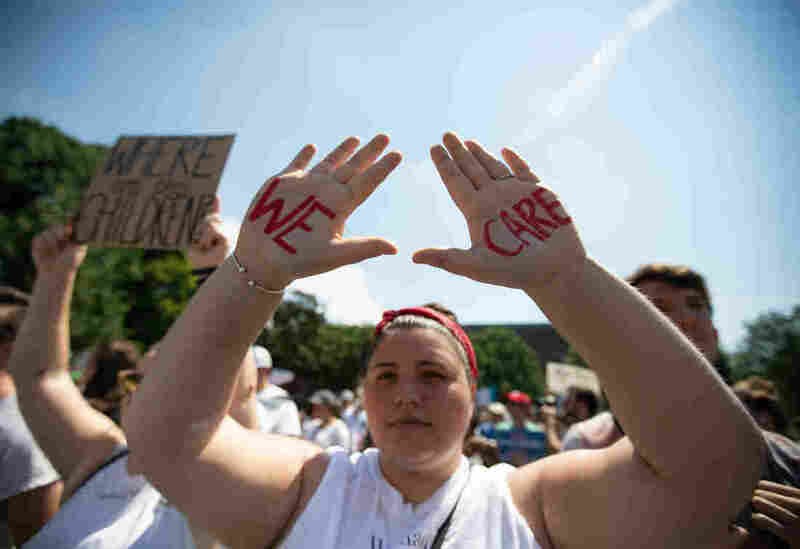 Many of them followed the call to action to wear white — a symbol of "unity and peace" according to the event's organizers — and they brought fans, umbrellas and coolers of ice for relief. Homemade signs were raised as shields against the beating sun and young children were slathered with sunblock and wore hats. Demonstrators braved the heat to march in protest of the Trump administration's immigration policies. 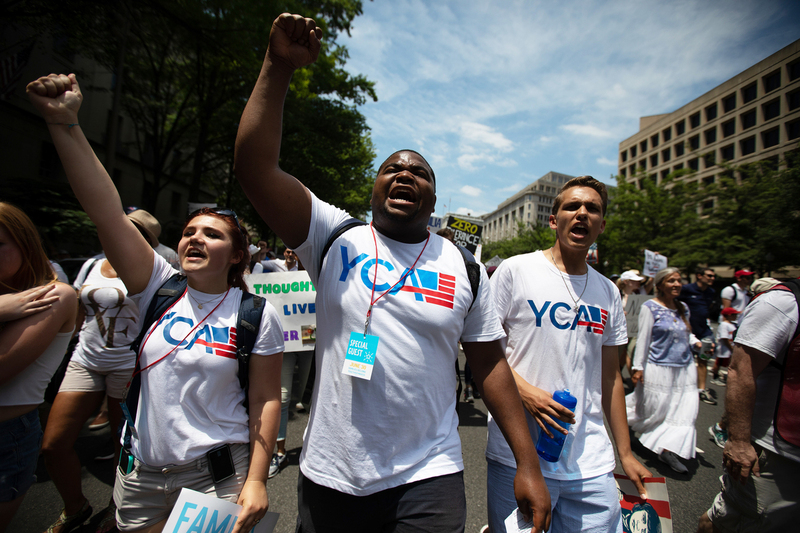 Among the thousands of protesters who showed up — joining national rallies happening across the country — it was the mothers and families who showed up with their young children, hoisted on shoulders and pushed in strollers, that sent a powerful message. The weeks of media coverage that highlighted the effects of the Trump administration's "zero tolerance policy," which separated immigrants from their children upon crossing the border, had struck a very personal nerve. Ceridwen Cherry, an ACLU attorney, and her husband, David Levine, from the Bloomingdale neighborhood of D.C., showed up intentionally with their young son Rhys to send a clear message. "It's important to show the administration that families belong together," Cherry explained. "We want to show them what a 17-month-old looks like, what it would mean for him to be apart from us." Anna McCall saw the protest as an opportunity to teach her daughters Amina, Makeda, Adama and Kamara about civic engagement. Anna McCall, a physician from Upper Marlboro, Md., showed up with her four daughters, ranging from ages 2 to 12. 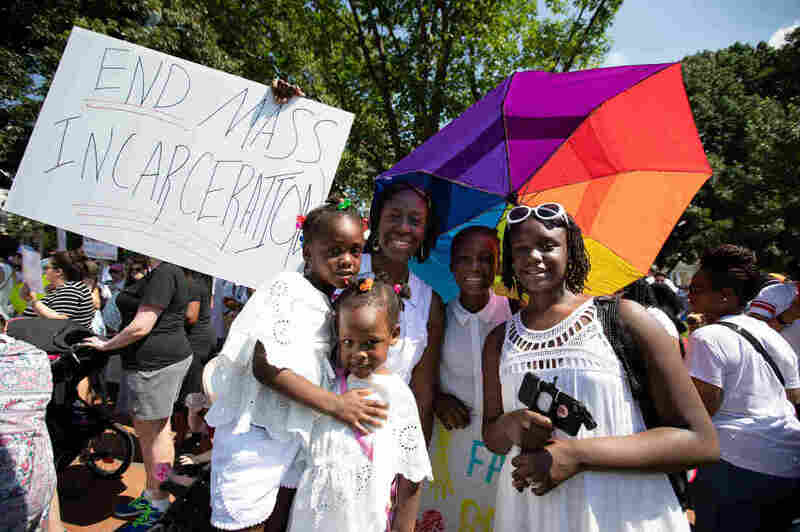 As a daughter of immigrants from Sierra Leone who's passionately concerned with mass incarceration, discussing the treatment of detained immigrants has been a critical topic in her family. "I give them bits and pieces as we go along, I explain it to them age-appropriately," McCall said, holding a rainbow umbrella, shading her youngest daughters. "I want to teach them you don't just sit and watch TV, we're here in the nation's capital. I'm from Oakland, Calif. If we were there we'd be doing the same thing. This is how I was raised, so I'm trying to raise them the same way." 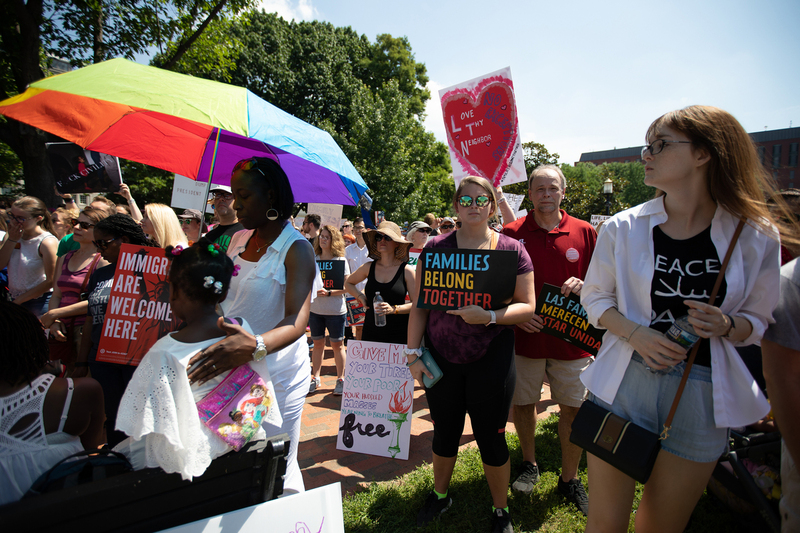 "Families Belong Together" protesters chanted in unison as they marched toward the Capitol. 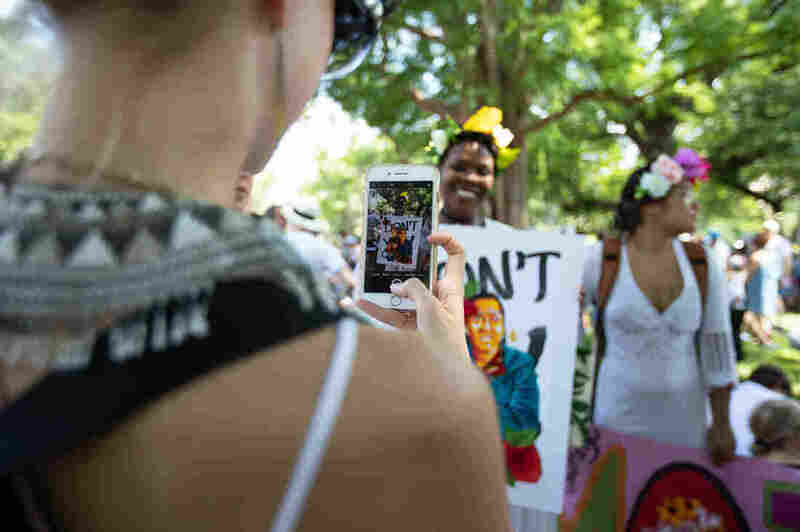 Members of the Omi Collective take photos of one another holding signs, calling their protest a tribute to women and an act of "performance art." Some women showed up with other women, bonded by their shared experiences of being mothers and their horrified reactions to recent news stories. Migui Adams, a mother, came to the rally with two childhood friends of more than 30 years. Adams wore an olive green shirt that mocked Melania Trump's controversial jacket during the first lady's visit to a detention shelter, a move that Adams called "a big slap in the face." Adams and her friends had felt personally affected by the coverage of detained children. "We were devastated, we were crying for days. It was incredible how emotional we've all become," Adams said. Attending the rally in D.C. was important to them — it was where they grew up. "We're also Hispanic Americans, we were born here, our parents came here," she explained. "We love D.C. ... This is our home." Migui Adams (center) wears a shirt that references Melania Trump's controversial jacket. One mother, Shelby Workman, arrived with her husband and two children, including her 5-year-old daughter, Blythe Marie. It was her young daughter's very first protest, and Workman wanted to teach her how to "speak up and to have a voice." She described her conflicted feelings as a concerned mother and a self-proclaimed "patriot." "As I was preparing for the Fourth of July for my kids — we always buy the red, white and blue, the flags ... I feel myself taking a little breath," Workman said. "I'm not proud of our country at the moment, I'm not proud of what we're doing. This I'm proud of, this rally I'm proud of." Workman made sure to dress Blythe in red, white and blue, a demonstration of her family's love of America, in spite of current events. Sanam Emami (right), with fellow Omi Collective members, is originally from Iran and says the tension in the immigration debate is rooted in a "detachment to the mother." In addition to mothers, others found the event as a way to celebrate the power and strength of women. One young man, a third-year law student from Georgetown University, carried a sign that said "Fight Like a Mother." 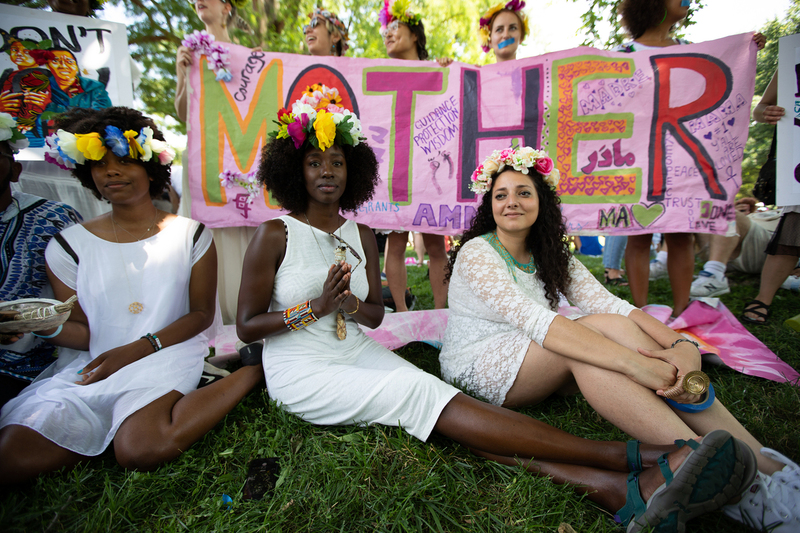 Women from Omi Collective, a D.C.-based group of artists, wore flower crowns and white dresses and said the protest was an opportunity to highlight femininity. "We all collectively really believe that a lot of the shortcomings and issues that we're facing right now are rooted in the detachment to the mother ... whether it be the feminine aspects of ourselves ... whether it be separation of children from their mother," said Sanam Emami, a visual artist with the collective. 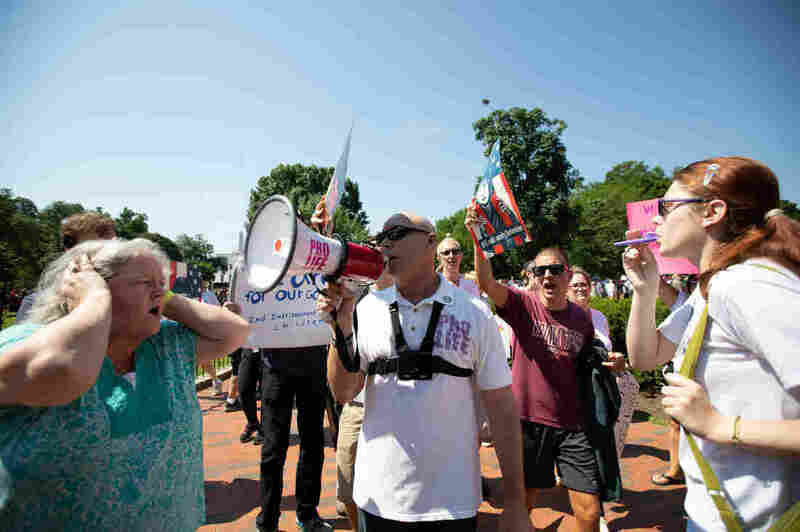 Anti-abortion-rights activists showed up at the "Families Belong Together" protest and denounced Planned Parenthood at Saturday's event. A number of attendees used the issue of family separation to protest Planned Parenthood and abortion rights. Some people responded by surrounding the anti-abortion-rights activists, and denounced their presence at the event. The shouts between the two sides raised tensions temporarily throughout the otherwise peaceful event. 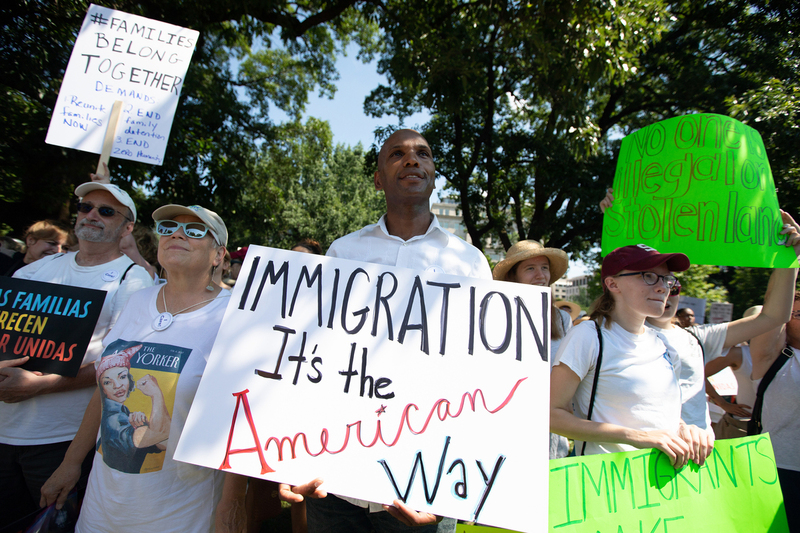 Demonstrators hold signs during a rally to protest the Trump administration's immigration policies in front of the White House on Saturday. 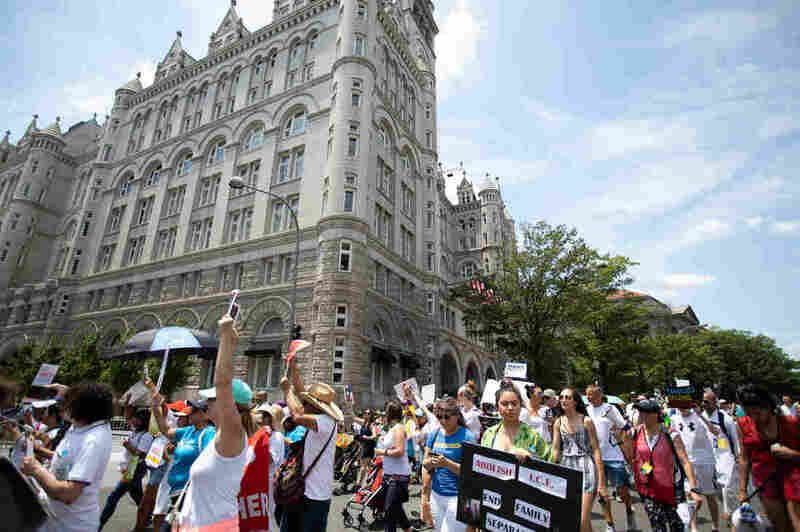 As the crowds dispersed and marched their way toward the Capitol, many protesters were mostly calm and chanted in unison until some of them were triggered by passing the barricaded Trump International Hotel on Pennsylvania Avenue. Some booed and yelled "shame, shame, shame!" at the building, which was surrounded by police officers. A demonstrator listens to the event's speakers at Saturday's "Families Belong Together" rally in Lafayette Square Park. Blocks away, Kevin Sinatra, 26, and Aida Cardoza, 22, shared their reasons for waking up early and taking the hourlong train ride from Woodbridge, Va., to attend the D.C. march. 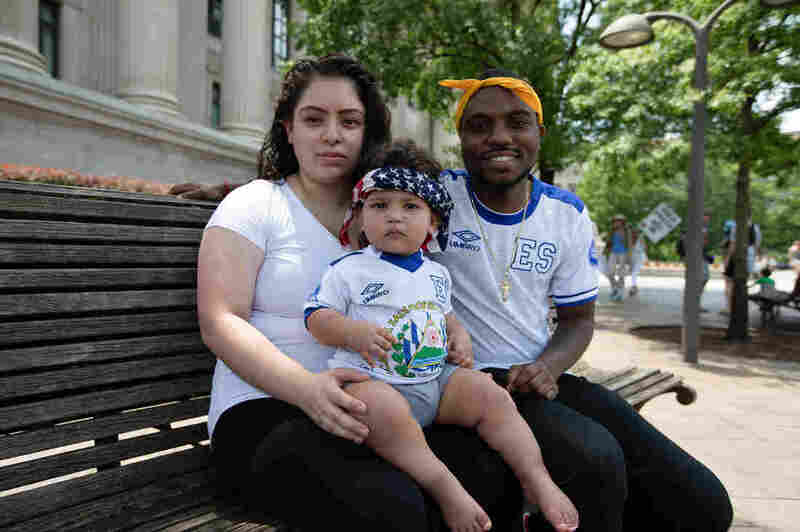 They brought their 1-year-old son Matthews, who wore an American flag bandanna around his forehead. Cardoza, the daughter of immigrants from El Salvador, said many Americans don't understand the fear and terror that Central Americans face in their home countries. She still has family — her grandmother, cousins and aunts — that have been affected by local gangs. She said her aunt is regularly forced to pay a monthly fee to gangsters or face violence, and her young cousin joined one of the violent gangs. Three years ago, her uncle fled the country after almost getting killed by four men who beat him up after he "looked at someone the wrong way," she said. "Being on foot from El Salvador is a three-month trek, it's dangerous," Cardoza said. "You wouldn't assume that risk if you didn't know what you're running away from is an even greater danger for your family. For them to come here, applying and seeking asylum, and being torn apart and thrown in cages, not even being told where their children is going, it's inhumane." Kevin Sinatra and Aida Cardoza brought their 1-year-old son Matthews to the protest. "We want him to know he's was a part of this movement." It's a deeply personal issue for Cardoza. Her voice choked as tears began to fall down her cheeks. "I feel like if this would've happened a year ago before I was a mom, it would've impacted me differently but now being a mom, having a 1-year-old," she said, with Matthews in her arms. "I don't know what I would do if somebody took him away from me, put him in a cage and I don't know who's watching him. It hits home."